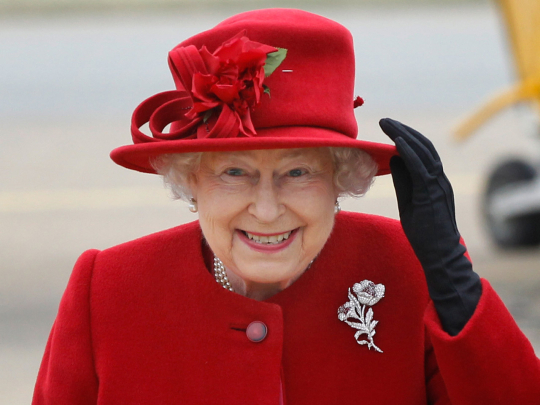 Queen Elizabeth II is set reach an important milestone this week–becoming Britain's longest-ruling head of state. Queen Elizabeth has worked with 12 British prime ministers, from Winston Churchill to David Cameron. At age 89, she continues to travel and attend official events. Elizabeth came to power after the death of her father, King George VI, on February 6, 1952. At the time, she was only 25 years old. She officially became queen in June of 1953. The queen is part of the last generation of Britain's royal family to be educated at home. The Associated Press reports that she is the first British ruler to have sent an email (1976) or use Twitter, the social networking service (2014). Royal historian Hugo Vickers says that during her rule, Queen Elizabeth has remained dutiful to her country. He adds that she is known as the "most invisible visible public woman in the world." Who held the record before her? On Wednesday, Elizabeth will beat a record set by her great-great-grandmother, Queen Victoria. Victoria served as queen more than a century ago for 63 years and seven months. Only four other British kings and queens have ruled 50 years or more. Queen Elizabeth already holds the record as the country's oldest ruler. The only other world leader with longer service is King Bhumibol Adulyadej of Thailand. He took power more than 69 years ago. In history, only a few monarchs have served even longer. Ngwenyama Sobhuza, later known as Sobhuza II, served as the Swazi King and later King of Swaziland for more than 82 years. He came to power before the age of one after the death of his father. In addition, Louis XIV served as King of France for 72 years. He was also aided by coming to power at a young age. British officials say Queen Elizabeth wants the record-setting occasion to be a quiet event and that the day will be "business as usual". The Queen is expected to leave her private home at Balmoral, Scotland to open the new Scottish Borders Railway. She will also take a steam train ride on the new railway from Edinburgh with her husband, Prince Philip. Children would bring them close together and break down this invisible barrier. She worked with great dedication to find a cure for the disease. According to Shiva, a young actress, when the reformist President Mohammad Khatami came to power in 1997, her generation was full of hope. She treated it as a link between herself and dutiful goodness. 1.Royal historian Hugo Vickers says that during her rule, Queen Elizabeth has remained dutiful to her country. He adds that she is known as the "most invisible visible public woman in the world." San Francisco is generally known as the "gate of east" of America. China has always been known as a land of propriety band righteousness. 2.British officials say Queen Elizabeth wants the record-setting occasion to be a quiet event and that the day will be "business as usual". The Queen is expected to leave her private home at Balmoral, Scotland to open the new Scottish Borders Railway. She will also take a steam train ride on the new railway from Edinburgh with her husband, Prince Philip. He expected to finish the work by March. At a service desk, the agent is expected to keep mum about her problems and to show a reasonable interest in yours.